Read about CapGain Solutions on the WSJ Venture Beat’s Venture Capital Dispatch by Lora Kolodny. 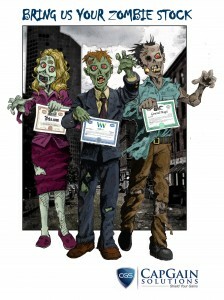 Sell us your zombie stocks before year end. Beat the rush and contact us today! Mention this post for a 60% discount on our document processing fees until December 27, 2013. We must complete the ATA by December 31st to shield your 2013 capital gains. Start the selling process now and complete the transaction in 24 hours or less! If you have a capital gain or capital gains you wish to offset for 2013, you have only two months to sell any losers. After December 31, 2013 it is too late. 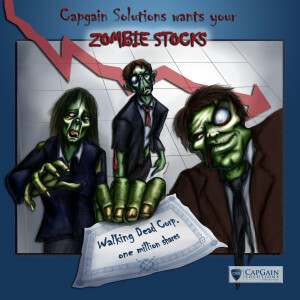 CapGain Solutions will purchase your zombie investments but it takes some time to do a transaction involving private stock. Thus, consider contacting us today to start the process. Tax season is approaching – get ready!